Cleveland Clinic researchers have discovered a new subtype of multiple sclerosis (MS), providing a better understanding of the individualized nature of the disease. MS has long been characterized as a disease of the brain's white matter, where immune cells destroy myelin—the fatty protective covering on nerve cells (neurons). The destruction of myelin (called demyelination) was believed to be responsible for neuron death that leads to irreversible disability in patients with MS. However, in the new findings, a research team led by Bruce Trapp, PhD, identified for the first time a subtype of the disease that features neuronal loss but no demyelination of the brain's white matter. The findings, published in Lancet Neurology, could potentially lead to more personalized diagnosis and treatments. The team's findings support the concept that neurodegeneration and demyelination can occur independently in MS and underscore the need for more sensitive MRI imaging techniques for evaluating brain pathology in real time and monitoring treatment response in patients with the disease. This new subtype of MS, called myelocortical MS (MCMS), was indistinguishable from traditional MS on MRI. The researchers observed that in MCMS, part of the neurons become swollen and look like typical MS lesions indicative of white matter myelin loss on MRI. The disease was only diagnosed in post-mortem tissues. In the study of brain tissue from 100 MS patients who donated their brains after death, the researchers observed that 12 brains did not have white matter demyelination. They compared microscopic tissue characteristics from the brains and spinal cords of 12 MCMS patients, 12 traditional MS patients and also individuals without neurological disease. Although both MCMS and traditional MS patients had typical MS lesions in the spinal cord and cerebral cortex, only the latter group had MS lesions in the brain white matter. Despite having no typical MS lesions in the white matter, MCMS brains did have reduced neuronal density and cortical thickness, which are hallmarks of brain degeneration also observed in traditional MS. Contrary to previous belief, these observations show that neuronal loss can occur independently of white matter demyelination. Dr. Trapp is internationally known for his work on mechanisms of neurodegeneration and repair in MS and has published more than 240 peer-reviewed articles and 40 book chapters. He also holds the Morris R. and Ruth V. Graham Endowed Chair in Biomedical Research. In 2017 he received the prestigious Outstanding Investigator Award by the National Institutes of Neurological Disorders and Stroke (NINDS) to examine the biology of MS and to seek treatments that could slow or reverse the disease. This study was supported in part by grants from NINDS (part of the National Institutes of Health) (# P50NS38667 and # R35NS09730) and the Multiple Sclerosis Society. Read the full press release in the Cleveland Clinic Newsroom. Photo: (A) A centimeter-thick slice from a typical MS brain. 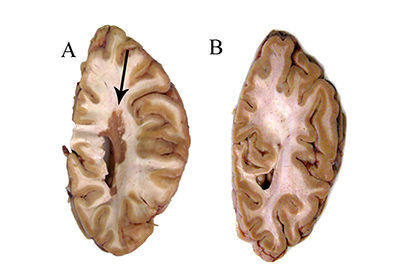 The arrow points to a large white matter lesion. (B) A centimeter-thick slice from a MCMS brain without white matter lesions. Reprinted from The Lancet Neurology, http://dx.doi.org/10.1016/S1474-4422(18)30245-X, Trapp et al, Cortical neuronal densities and cerebral white matter demyelination in multiple sclerosis: a retrospective study, Copyright (2018), with permission from Elsevier.